Thursday was a dreadful morning on the weather front but we went ahead with our planned trip into London. The previous day, Carol had spotted an attractive “four for two” deal on travel cards (which include the otherwise-outrageously-priced Underground: £4 a journey, indeed). After a leisurely breakfast we headed for the station to catch the 9:25 AM where I dropped the passengers off to buy the tickets while I parked the car. “£5.50 please”, quoth the lady at barrier. “Can I plastic it?”, I enquired. “No, we don’t have that facility”, she responded. “What, for £5.50; you’re kidding”, I retorted, digging out my last tenner. Handing me the change, she now says, “go and try to get parked and, if there isn’t a place, come back and I’ll give you a refund; we’re getting full”. Strewth! Fortunately I manage to find a spot albeit surrounded by a sea of mud and water. If we seriously want people to stop driving, why on Earth don’t we supply enough decent car parking at the stations, especially for £5.50? Meanwhile, Carol has the value Travel Cards, the train arrives on time and we get to Euston in 45 minutes and reasonable comfort (i.e. seated, since the main commute has finished). On to the Underground where the girls plan to visit Harrods while the boys go a stop further to see my favourite old boyhood attraction, the Science Museum. After about 90 minutes, I can’t help but think that it’s a pale shadow of its former self. Inside, the building now looks very modern and I couldn’t find the many “animated” display cases that I remembered being so much fun. “Inside the Spitfire”, which I was quite looking forward to, is simply a dissected Spitfire, looking like a large Airfix kit, and is so superficial as to seem pointless. I suspect anyone who has actually assembled the Airfix kit would already know more than this display tells them. I recall fondly the wonderful enormous pendulum that used to scribe the Earth’s rotation in a tray of sand but that no longer seems to exist, either. Now, the museum appears to contain mostly cafes, simulator rides and Imax cinema. Keith did find Stevenson’s Rocket to sate his train craving, though. After that we had a quick 30 minutes in the adjoining Natural History Museum to see the dino bones in the mercifully still wonderful Central Hall, the architecture of which is stunning and still looks so. Then it was off up Brompton Road to meet the Harroding ladies for lunch in a pub. We were then encouraged into Harrods ourselves, I think mainly to see the Princess Di and Dodi memorial. 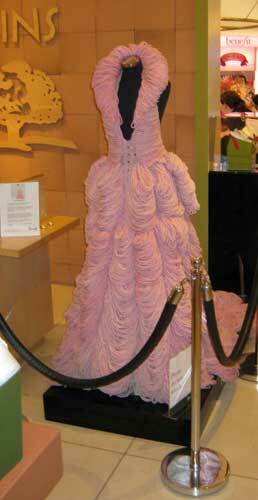 However, a somewhat bizarre display of yarn fashioned into a flowing gown in the knitting department appeared a tad more interesting. 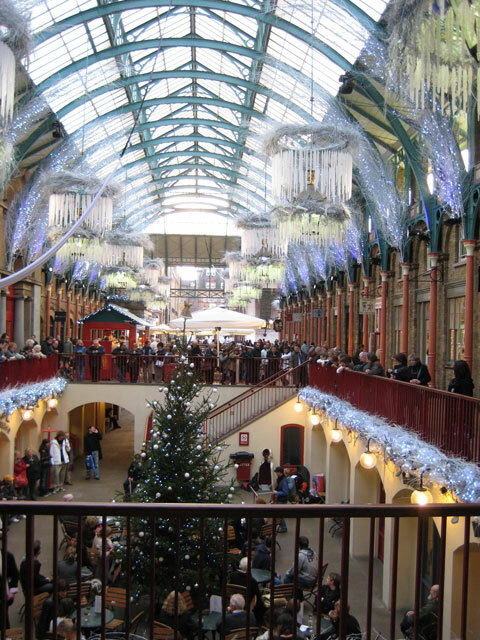 Back to the underground and up to Covent Garden, another of my favourite London haunts, largely because the street entertainers are so much fun. 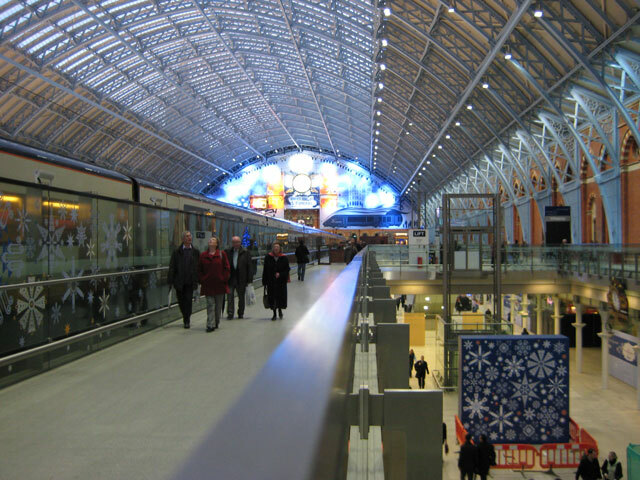 The legs were beginning to tire but a small purchase of some Thornton’s chocolate upped the blood sugar and gave us just about enough energy to divert to the recently revamped St. Pancras for another train enthusiast visit. It does look impressive on the inside and there was a Eurostar in port for Keith to see. Finally, it was back to Euston for the 4:55 PM non-stop service to Leighton Buzzard where we salvaged the car from its muddy puddle to return for some long anticipated drinks and spaghetti Bolognese salvaged from our freezer.